Note: Updated in July 2018 for clarity and additional resources. Compassion is our true nature. It is a practice I’ve been bringing into my daily life as much as I can. So I want to take a deep-dive into what it means to be in the experience and expression of compassion. In this video and post I share a few tools that help you tap into the feeling of compassion so you can understand and practice it in daily life. These practices will help you live your truth by connecting you with the deep well of compassion within you. Take a moment to think of a time when you’d done something, thought something or sent energy to someone with compassion. Take yourself to that moment and see yourself in that experience and that expression of compassion. Maybe you were loving someone even in the midst of their negative behavior, or maybe you were willing to let go of a resentment and choose to see someone with more kindness. Or maybe you showed up for somebody in a way that you may not have otherwise been able to. Take a moment to tap into that experience and what it felt like to be in the expression of compassion. Let yourself really feel what that feels like. Write down what it feels like in your body and how it feels energetically to be compassionate. The next step is to send love and compassion to someone that you know or someone that you don’t know. You can send compassion to people halfway across the world from you. If you see a story in the news about people suffering in a war, for example, you can send love and compassion their way. Send compassion to people who do not have what you have, who do not have the privilege or the safety or the security that you know. You can also send compassion to someone you do know. Try sending compassion to someone you’ve been resenting. Be really gentle and kind with yourself. Let go of that old story. The more compassionate you can be toward yourself, the more compassionate you’ll be toward the world. Strengthen compassion with my FREE Judgment Detox Mini Course! 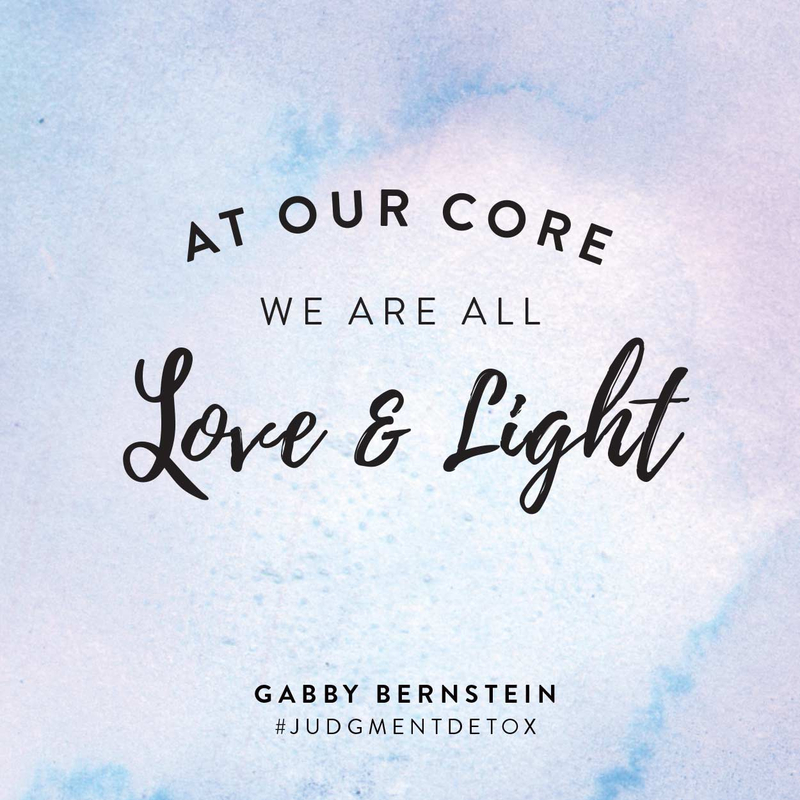 I created a free 3-part mini course that guides you through some of the core practices of my book Judgment Detox. The mini course is delivered via email and takes just a few minutes a day. You’ll experience relief and feel better fast! Click here to get your free Judgment Detox Mini Course. Thank you for another great video and for speaking truth. I noticed something different in your ending comments. You now say “I hope this serves you.” I remember you saying “I know this will serve you.” Why did you switch? I love hearing you say “I know…” There is so much power and conviction in your voice when you say it and you always inspire me. not sure;) i know it will serve you though. Thank you Gabby. You have helped me on my journey today, as compassion is something I really need to cultivate today, for me and those that are hurting because of me and because of them. Now I will write my compassions and meditate to send my compassion to them all. A walk in the fresh air will be my compassion, with a walking mantra, ‘I am worthy, I am love’. I have been practicing compassion. For myself and others. Its very freeing, you don’t feel like you need to hold on to things. The need to control subsides. I recite this Mantra: May you be well, May you be happy, May you be peaceful. May you be loved. Compassion is who we are at our core: we are love, we are compassion. Today I did not feel like I am neither love nor compassion. Why? Because I am hurting. Today I need to cultivate the seeds of compassion that are at my core, for myself and for those that feel I have wronged them. Today, in the midst of my mind talking me through all the painful memories of what was said, what might have been said, who was ‘wrong’, who is ‘right’, closing down, dis-trust, tears over and over again, moments of vulnerability, and wondering whether it is all worth it, I had a revelation. I realised, WE ARE ALL HURTING. That moment, that revelation was the watering of my seeds. In the moment I remembered what I am at my core and I realised, I am love and they are love. That was the moment I felt compassion for their hurting, for their pain, for their inability to be vulnerable and for my closed doors. ‘I am worthy, I am love, I am forgiven and I forgive’ Today’s Mantra. Today, I have changed the story in my head. Today, I am feeling their pain instead of their blame. Today, I am sending my compassion, my love to you all. Today, I am learning to forgive through the seeds of compassion. Today, I am worthy, I am love, I am forgiven and I forgive. Thank you Gabby. You video came just after this revelation. Gabby, thank you for this video today. As always, messages come to us at just the right moment. I have been deeply struggling for the last several months over a relationship that ended without any type of “closure.” One afternoon he just simply stopped all communication. As you can imagine, it has stirred up all of the feelings of abandonment from my childhood – the universe sending me exactly what I needed to heal – and it is has been grueling for me. This video helped me make a few needed connections though: the way he treated me is a reflection of how he feels about himself, not a statement about my worth. Instead of thinking I’m not lovable, I’m shifting my thoughts to compassion for him. If he treats others that poorly, how awful must it be inside his heart and his head? And I’m shifting thoughts to compassion for myself – as difficult as it is for me to admit, he is a mirror for me, magnifying parts of myself that I don’t like so much either and need to acknowledge so that I can grow and heal. There is definitely painful, icky, uncomfortable stuff coming up to the surface, but I feel like I’m making progress. I’m seeing a light that I haven’t seen in a while and I believe that I can sit in a place of compassion for both he and I tonight. Thank you so much Gabby this was beautiful.